The World War II era B-17 bomber known as “The Flying Fortress” visited the Smyrna airfield last Saturday. 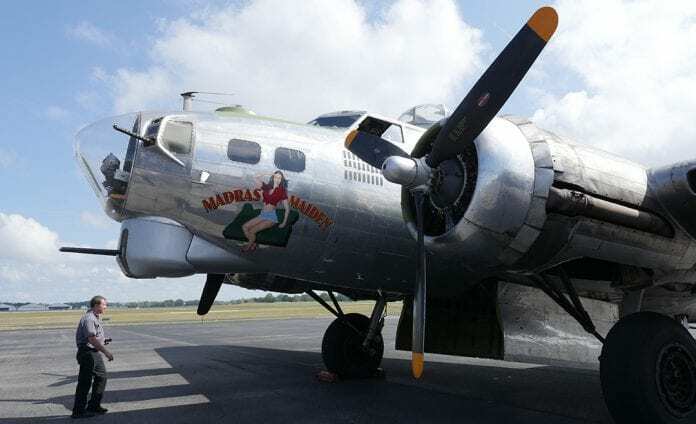 SMYRNA, TN — A tour of the B-17 “Flying Fortress” bomber plane that played an important role in the World War II air battles in over Nazi Germany landed at the Smyrna airport for tours last weekend. The public was invited to come see the airplane and inspect the interior at no charge until sunset. More fearless folk who had $450 to contribute to the (tax deductible) maintenance of the flying museum took a ride in the Flying Fortress earlier in the day. During the flight, riders experienced what it was like to operate various gunner positions in a moving B-17 bomber as a skilled pilot took them on a tour of the area. Named the “Madras Maiden” after the town of Madras in Oregon where it was constructed, the B-17 is one of few B-17s that still fly today. This particular B-17, along with several others such as the Memphis Belle, operates as a flying museum and memorial to the sacrifices of the airmen who flew dangerous missions in World War II. The plane was acquired by The Liberty Foundation after its military career as a research and development aircraft from 1944-1959. Bob Hill, pilot of many of the B-17 tours for The Liberty Foundation has flown 1,400 hours on the massive plane. “I would like to think we inspire someone to do something like learn more about the history of World War II and the sacrifices the “the Greatest Generation” accomplished for our freedom,” Hill said. “Or perhaps someone will want to become a pilot or aircraft maintenance engineer,” Hill said. “A bomber crew member in WWII had only a 23% chance of survival. Each crew member had to go on 25 missions (which later increased to 30, then 35 missions). You were flying in a craft that was unpressurized, with no air conditioning or heat. So it might be 40 degrees below zero with your mask frozen to your face, or as hot as an oven. You had to deal with flak from attacking planes. The B-17s flew in formation at a relatively slow speed of 150 mph so they were big targets,” Hill said. The Tuskegee airmen based out of North Africa were assigned as escorts for the 8th Airforce B-17 raids and other bombing raids over Nazi Germany. According to historical sources, bombing missions defended by the Tuskegee Airmen never lost a bomber. Persons who become Liberty Foundation members (for $40) pay only $410 for future B-17 flights and the flights of family members.